Family Guy's Send in Stewie, Please was an eye-opening episode for long-time fans of the hit Fox series. The commercial-free episode aired last night, and it revealed what Stewie sounds like when he's being himself. And it addressed his sexuality as well, which has been a long-running joke on the series. It's discovered that Stewie Griffin is pretending to be someone that he's not, which has been speculated about for over a decade with his British accent and overall demeanor. Last night's Family Guy featured Ian McKellan as Stewie's therapist Dr. Cecil Pritchfield and he was able to call out the baby on his fake British accent right away. Audiences were stunned to finally hear his real voice, almost like hearing Maggie Simpson for the first time. Stewie Griffin was sent to the therapist after doing something pretty evil to a classmate. Family Guy writer Gary Janetti had this to say about the accent. "I liked the idea of that being the reveal. It felt truthful that somebody who didn't feel like he fit in would create an artificial personality. To an extent, that's what he's done. And then to have Ian's character, the one person he's sharing this big secret with, not even hear the difference was another fun opportunity. It felt like a good way to show Stewie's insecurities in a way that felt truthful to the history of the series." Dealing with Stewie Griffin's sexuality was a different factor for Family Guy writers and creator Seth MacFarlane. As it turns out, the crew decided to keep Stewie's sexuality uncertain, just as it has done over the years. When it comes down to it, Stewie is a baby and it wasn't something that anyone felt really needed to be addressed head on. Gary Janetti explains. "Stewie's awareness of his sexuality is this uncertain thing, and that needs to stay as it is. His uncertainty gives him a vulnerability, which is something we need to maintain for the series. Whether he is (gay) or not, that isn't going to be answered when he's a one-year-old. But if you read between the lines, it's not that difficult to decipher. He's not even sure heterosexual is a real word!" Gary Janetti said that they had discussions with creator Seth MacFarlane about the issue of Stewie's sexuality and he agreed about not wanting to make it crystal clear. MacFarlane said that it was better to have it feel like Stewie doesn't even know since he's a still a baby. So it was decided to stay undetermined for now, which makes perfect sense, even though Janetti seems to think that the answer is pretty obvious. 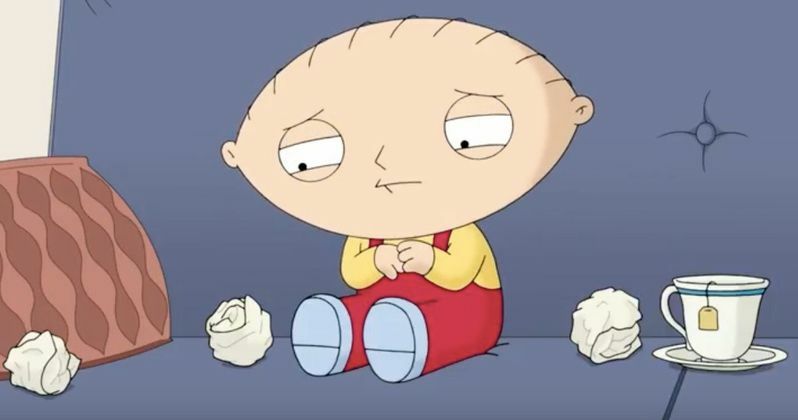 Seth MacFarlane had a lot of groundwork to cover in the Send in the Stewie episode and as usual, provided many voices. But it was the naked Stewie voice that made all the difference and it sounds a lot like Peter Griffin's voice, but higher-pitched. You can check out the clip of Stewie talking in his normal voice below, thanks to the Animation on Fox YouTube channel and then speculate on your own about his sexuality.